The Mentoring Program was one of the many social features in the game. 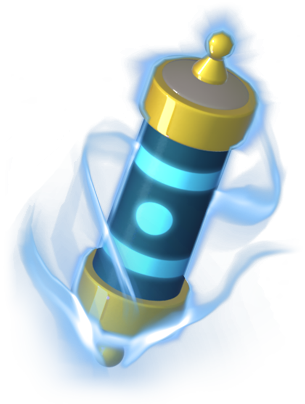 Introduced in Update 3.6, it was a means for experienced Trainers (hereafter referred to as mentors) to guide new Trainers (hereafter referred to as apprentices) throughout their first steps of the game. Both the mentor and the apprentice had to be on the same platform and server. This option could not be accessed by Trainers who had set their age to 16 or younger upon registering their account. The Mentoring Program could be accessed through the tab on the left-hand side of the screen. All related notifications were indicated when the icon was displayed in the top-right corner of the tab. However, notifications that indicated when the quest slot was free were represented by the icon which was displayed in the bottom-right corner of the tab. The Mentoring Program was permanently discontinued in Update 4.3. The mentor and the apprentice can interact with each other through the chat feature. Every mentor has a separate chat window for each of their apprentices. Messages are written at the top of the chat interface and then sent through the button (the message can also be sent through the enter key on the keyboard). The names of Trainer are colored in white over a dark gray background while the background color for messages is light gray with black text. However, Trainers have the option to color their text by adding # and any number from 1 to 7 before their text. Messages are limited to 512 characters and profanity is censored with asterisks. Trainers can only become mentors starting with Level 70. A Trainer can mentor four apprentices at the same time. Once inside the main menu, the Trainer can see all four of their apprentice slots at the top of the screen. For the first three slots, Trainers have the option of adding apprentices based on the language they chose when applying for the apprenticeship. This is done by simply selecting the option and then choosing the desired language. The same slots are reserved for finding apprentices through the button. If there are available apprentices, pressing this button will automatically assign one to the mentoring Trainer. The last slot is for apprenticing a Trainer through the Recruitment Code. The apprentice will have to enter the mentor's Recruitment Code in order to establish the connection. The mentoring Trainer has the option of enabling or disabling this slot. 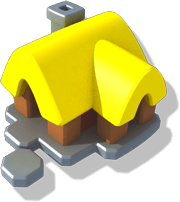 Once an apprentice has been found, the mentor has the option of visiting their apprentice's islands, gifting them, assigning them one of three available quests, or even revoking their apprenticeship by pressing the button and then the button. In the same screen, the mentor can see the apprentice's current level, their total amount of unique Dragons, the current Main Quest they are facing in the Normal Mode of the Campaign Map and the time they were last online. If a mentor has revoked three apprentices in a timeframe of under 3 hours, all of their unoccupied slots will be put on hold for 3 hours, making the Trainer unable to find any new apprentices during that time. If an apprentice has revoked the mentorship of the Trainer, the Trainer will then have to press the button in order to free the spot for other possible apprentices. Once an apprentice reaches Level 17, their apprenticeship is concluded and the mentor will be rewarded a Present from Apprentice. 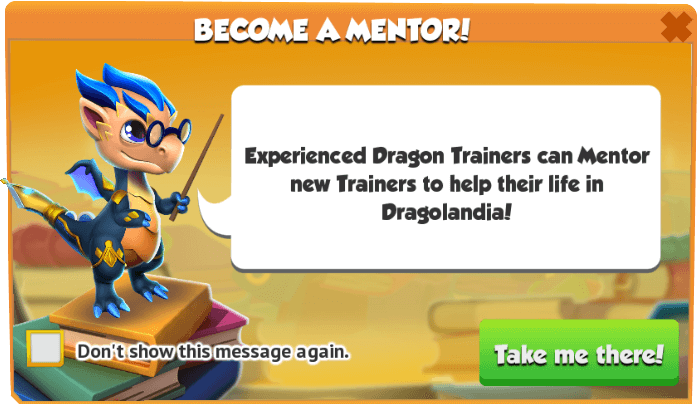 Once 10 Trainers have successfully concluded their apprenticeship, the mentoring Trainer will be rewarded with the Professor Dragon. It is not necessary for apprentices to interact with their mentor or even complete the quests they were assigned by them in order for them to count as alumni for their mentoring Trainer once their apprenticeship is over. They will count as alumni as long as they have reached Level 17 under the tutelage of a mentoring Trainer. Mentors can see the total number of apprentices they have successfully tutored under the tab. Under this tab, the mentor can also communicate with any of their alumni by simply tapping their name, or can visit their islands or remove them from the list. Additionally, all of the mentoring Trainer's alumni and even their own former mentor can be seen and communicated with under the tab of the Friend System. Trainers can become apprentices starting with Level 7 but can be no higher than Level 11. Once inside the main menu, before applying, the Trainer has the choice to select the desired language through the option and then they can try and find a mentor through the button or add a mentor directly through the button. If the Trainer chooses the former option, they might have to wait a certain period of time until they are paired with a mentor. However, the Trainer can still play while the game automatically searches for a free mentor. If the Trainer chooses to use the latter option, they will have to enter the Recruitment Code of the mentor, provided the slot is free and the mentoring Trainer has enabled it. Entering the code will reward none of the Trainers with additional benefits. 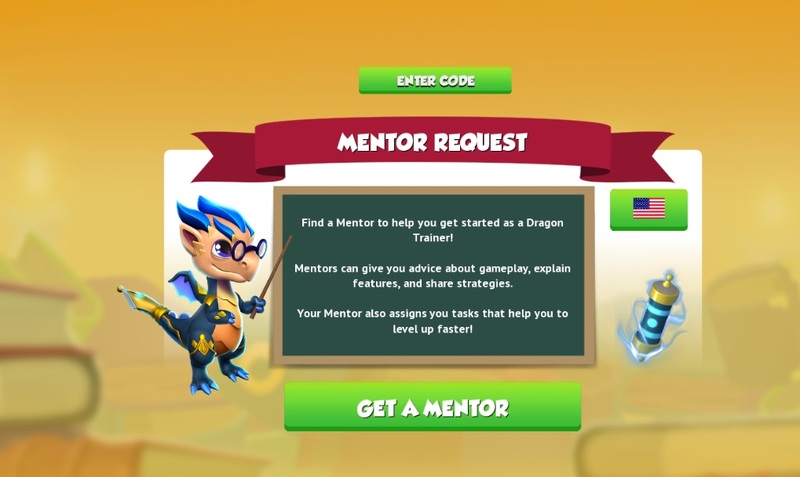 Once a mentor has been found, the apprentice has the option of visiting their mentor's islands, gifting them, or even revoking their mentorship by pressing the button and then the button. 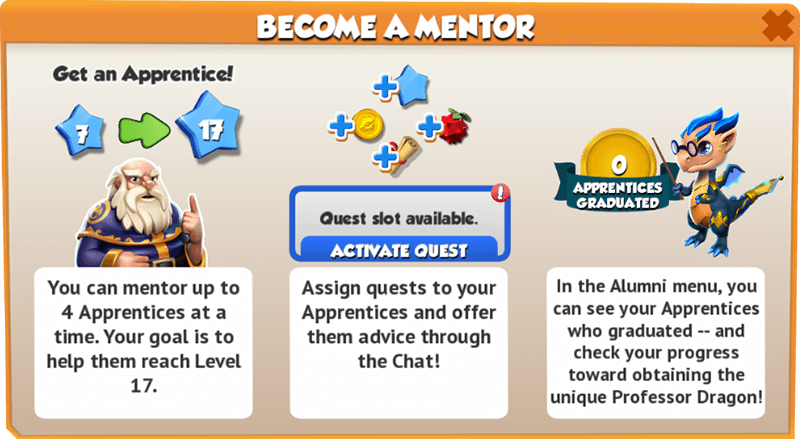 In the same screen, the apprentice can see their own level, the currently active quest they have to complete (if available) and the time the mentor was last online. If a mentor revokes the apprenticeship of a Trainer or if an apprentice revokes the mentorship of a Trainer, or if an apprentice has reached Level 17, the apprentice will have the option of rating the mentor bad or good . If they choose the latter, no additional steps will be needed to finalize the action, but if they choose the former, they will have to choose one of Mentor had communication issues, Mentor was hostile towards me, Inactivity on Mentor side, and I experienced other issues in order to conclude the rating. A Trainer can have only one mentor at any given time, but they can always revoke their current mentor and replace them with another one. Once an apprentice reaches Level 17, their apprenticeship is concluded and they will be rewarded an Arcane Diploma. 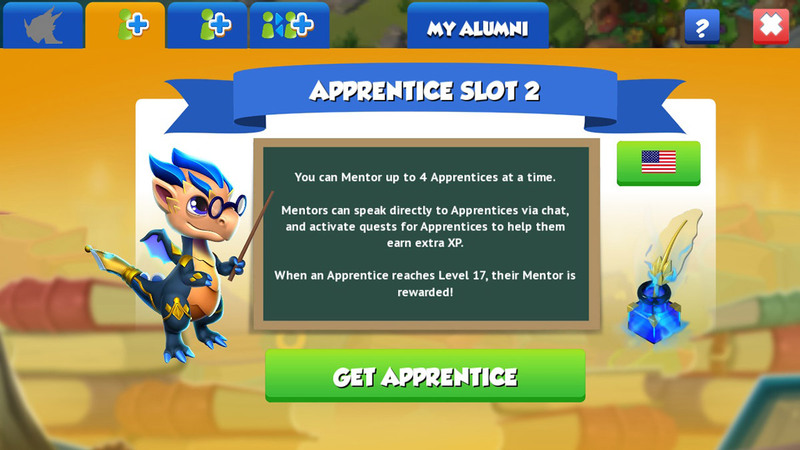 Apprentices can keep in touch with their former mentor and even their own future alumni through the tab of the Friend System and, until they reach Level 22, through the main interface of the Mentoring Program. Only one quest per apprentice can be active at any given time. The mentor has the option to cancel any active quest, but there is a 2-hour cooldown period before a new quest can be assigned. There are a total of 42 different quests with only 3 to choose from at any given time. 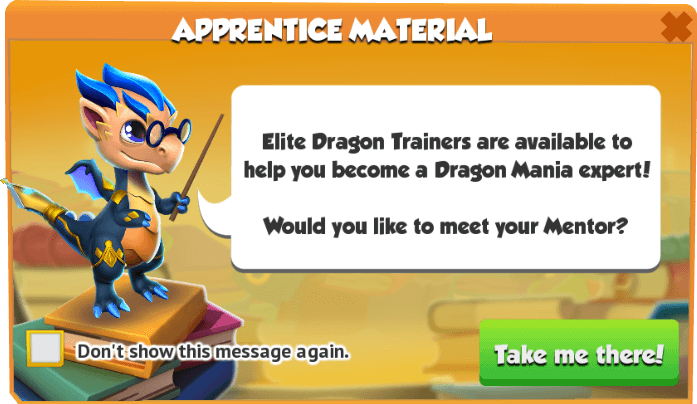 Some of the quests are unique while others will appear only when the apprentice reaches a specific level. Additionally, some of the quests scale in accordance with the Trainer's level. For example, a quest requiring a Level 7 apprentice to achieve 14 perfect hits will require a Level 10 apprentice to inflict 2.2 times the amount of perfect hits, namely 18 perfect hits. Once a quest has been completed, a notification at the top of the screen will be shown and there is a 1-hour cooldown before a new quest can be assigned. 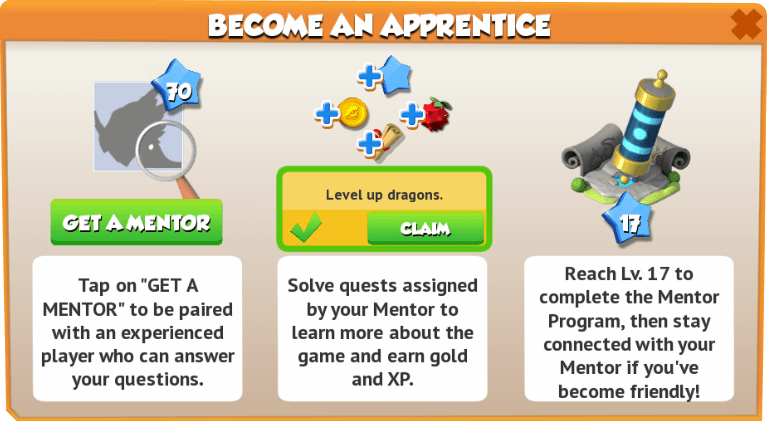 Upon completion, a Level 7 apprentice will be rewarded with 35 experience points and either 200 Gold or 20 Food while the mentor will receive no reward. The rewards scale in accordance to the apprentice's level but do not depend on the Level Modifier. 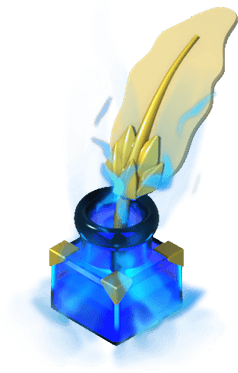 Thus, for example, a Level 10 apprentice will receive 2.2 times the amount of the base reward (77 experience and either 440 Gold or 44 Food). ↑ 1.00 1.01 1.02 1.03 1.04 1.05 1.06 1.07 1.08 1.09 1.10 1.11 1.12 The repetition multiplier does not apply to these quests. ↑ 2.0 2.1 2.2 2.3 2.4 These quests are encountered only once and the repetition multiplier does not apply to them. Update 3.7 increased the level needed to become a mentor from 22 to 70. This page was last edited on 30 January 2019, at 22:54.